Filmmakers and participants in the events surrounding the Boston Marathon bombings -- including (from left) former Boston police commissioner Ed Davis, Watertown police sergeant Jeff Pugliese, director Peter Berg, FBI special agent Richard DesLauriers, actor Mark Wahlberg, and Boston police commissioner Billy Evans -- came together on Dec. 15, 2016, for a press conference to promote the new film "Patriots Day" at the Intercontinental Hotel in Boston. Peter Berg’s new film “Patriots Day” has gained attention nationwide, but especially locally due to the film being based on the 2013 Boston Marathon bombings. With the events that followed the bombings taking place in Watertown, and a portion of the movie being filmed here, it comes as no surprise that there is much interest in the movie from many citizens of Watertown. The people of Watertown have a unique view of the events that took place — for some of us — in our own backyards. 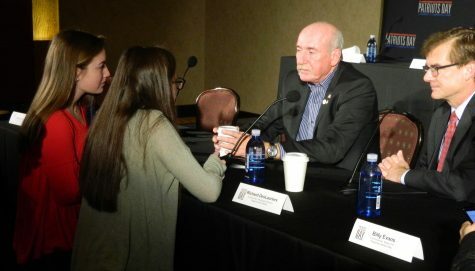 Watertown police sergeant Jeff Pugliese (second from right) and FBI special agent Richard DesLauriers (right) speak with Raider Times reporters from Watertown High School at a press conference to promote “Patriots Day” on Dec. 15, 2016, at the Intercontinental Hotel in Boston. On Dec. 15, a press conference for the film was held at the Intercontinental Hotel in Boston. The large room was filled with seats for reporters from all over the Boston area. At the front of the room there was a stage with seats and name plaques for each person involved with the film — the director, actors, writers, Watertown’s own Officer Jeff Pugliese, carjacking victim Danny Meng, and two survivors of the bombings, Patrick Downes and Jessica Kensky. The buzz of the crowded room of reporters came to a stop when a group of people entered the room and began to make their way to their seats on stage. The press conference started with host Lisa Hughes asking a few questions to each person on stage before questions were opened up to the reporters. Most questions that were asked related to the making of the movie and were directed at arguably the most well-known individual on stage, actor Mark Wahlberg. Patrick Downes, Jessica Kensky, and Danny Meng (left to right) answer questions at a press conference to promote “Patriots Day” on Dec. 15, 2016, at the Intercontinental Hotel in Boston. A recurring idea that came up throughout the press conference was the concept of “getting it right.” Out of respect for the people affected by this tragedy, it was important to everyone involved in the film that it be done correctly and accurately. “Get it right. That was something that was said very often when filming,” said Berg. After much discussion between the host and the guests on the stage, we had the opportunity to talk to Wahlberg one-on-one. 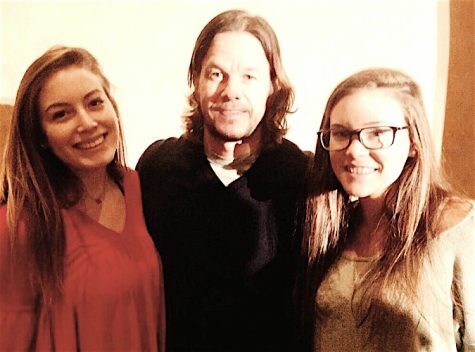 Mark Wahlberg (center) poses with reporters from the Raider Times after a press conference to promote his new film “Patriots Day” on Dec. 15, 2016, at the Intercontinental Hotel in Boston. In an effort to learn more about the Watertown aspect of the movie, we got the chance to speak to Officer Pugliese. He was very clear with his answers, describing the day it all happened to us with extreme detail. We were intrigued to find out that he had been out on leave due to injury, allowing him to be present during the filming process. He explained his feelings about the shootout to us in one simple sentence, “I can’t believe that he missed me.” This describes the frightening intimacy he felt while trying to take one of the bombers down and the lack of protection he had while face to face in the shootout. 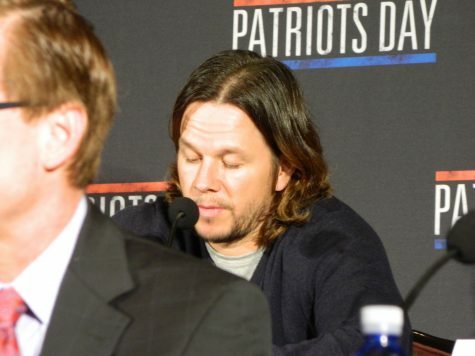 Mark Wahlberg answers questions at a press conference to promote his new film “Patriots Day” on Dec. 15, 2016, at the Intercontinental Hotel in Boston. 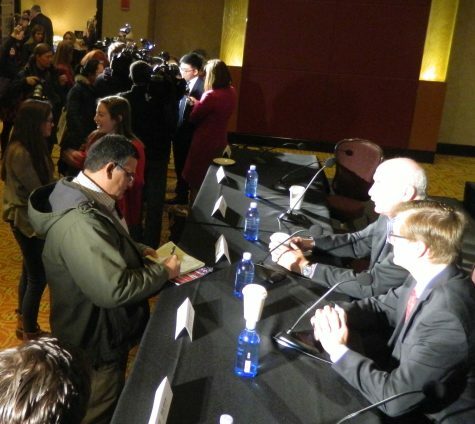 Reporters interview Danny Meng (background) and Watertown police sergeant Jeff Pugliese and FBI special agent Richard DesLauriers at a press conference to promote “Patriots Day” on Dec. 15, 2016, at the Intercontinental Hotel in Boston. Katherine Lawn is a member of the Raider Times staff. A well-written piece that captures the attempt of “Patriots Day” to get the story right while balanced against the real life impact on the Watertown community. Well done!